I had put my Hummingbird feeders out a couple of weeks ago. My sister-in-law saw some in her yard already. On Saturday I noticed that quite a lot of the Hummingbird solution was gone from one feeder. I looked at the concrete under the feeder and saw that it was sticky and wet. The only culprit to make that kind of mess is an Oriole. I let my dog out a little while ago and sat under the canopy on our patio to soak up some sun on my RA hands. As I sat there with my eyes closed I heard a bird talking to me. 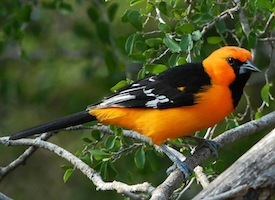 I opened my eyes and there was an Oriole about five feet from me. He was giving me what for! He either didn’t want me out there or I was too close to “his feeder.” They are too big for the Hummingbird feeders and tilt it too far, that is why so much solution is missing. He is welcome though. I love watching the pretty birds! !